The miter saw (also called a chop saw) gets used on every project I do. I even use it for breaking down scrap that will go into the fireplace. It might get used as much as the table saw. 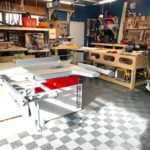 I’ve been wanting a t-track and stop block setup that stops the need for measuring and marking every cut with a tape measure. That would also allow for repetitive cuts of the same length, which I do quite often. 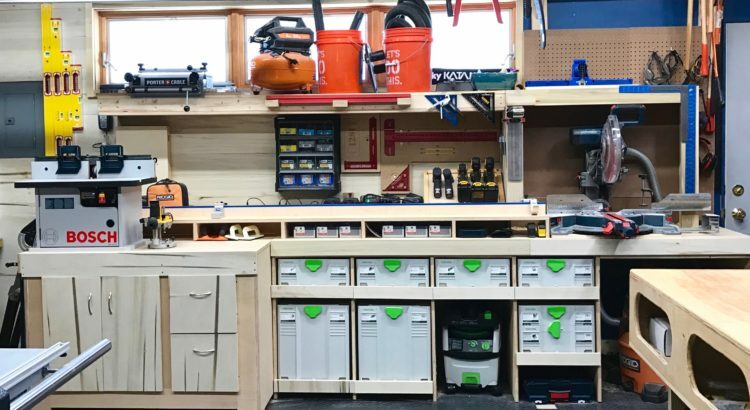 A proper miter saw station should cost around $500 to $1,000 in lumber. Although I am totally fine with that, this iteration wasn’t going to be the big build. This iteration is, like the first one, an evolutionary step. And this iteration, also like the first one, is going to be made mostly from scraps. 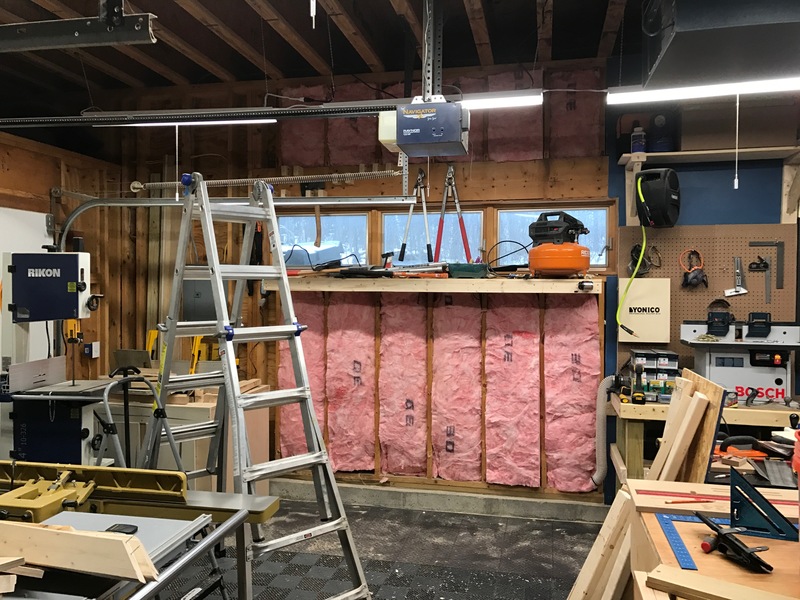 In order to get started I had to insulate the remainder of garage wall. 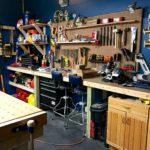 This is where I spent the most money because I used 3/4″ thick poplar plywood instead of sheet rock. At Home Depot R30 insulation rolls were on sale for $19.99 and it took 3.25 of those to finish filling the wall. 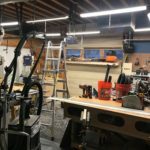 It took 3.5 4×8′ sheets of plywood ($39.99 per sheet) to cover things up and roughly 30 board feet of 4″ 4/4 poplar to do some trimming. So, 4 rolls of insulation, 4 sheets of plywood and 30 bdft @ $1.69 p/foot comes out to a total of $290 + tax. 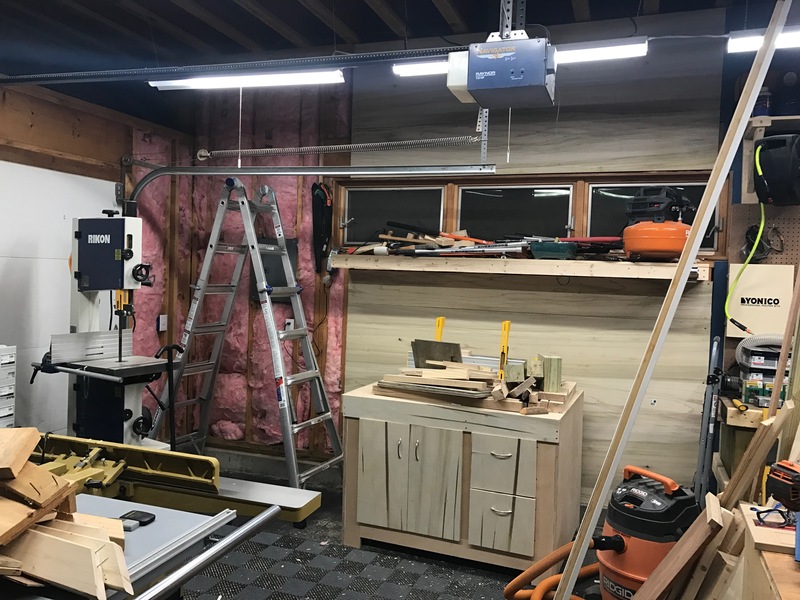 Let’s call it $300 to finish the garage wall. I think I bought 2 sheets of some Ecuadorian sanded ply for about the same price to build the miter saw station. And Kreg T-Track was $120. So, all in all, the full project cost was $500 in new expenses. 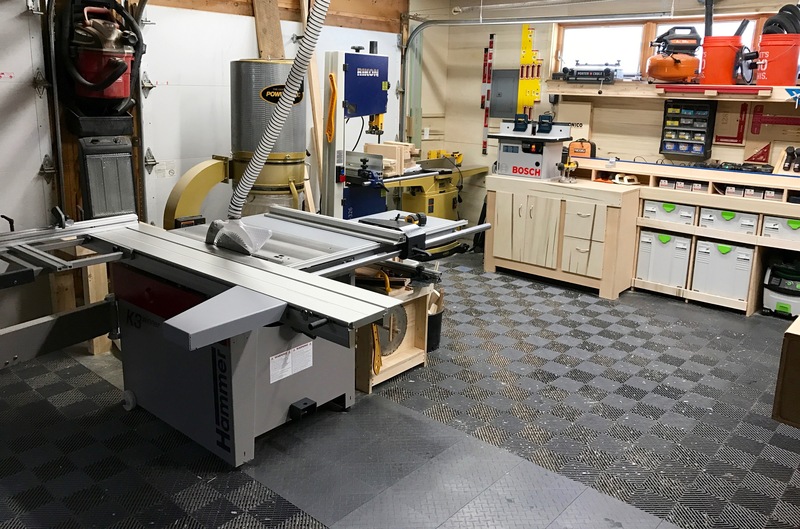 $200 toward the miter saw station. And only $80 of the whole thing might be scrapped at a later date. In the future, I’d like to make proper cabinet carcasses along with more upper storage. 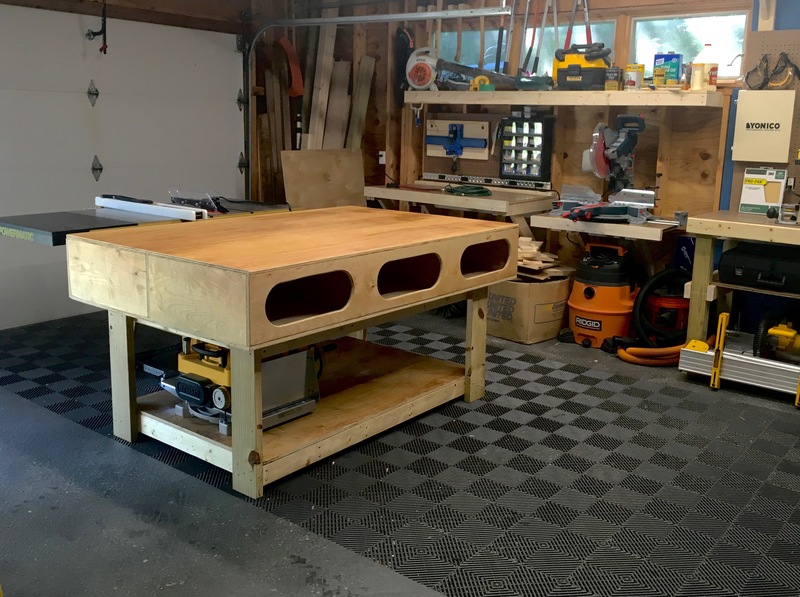 I’d also like to house my router table in something more sturdy. But I really need to do a few months of projects with this setup first. 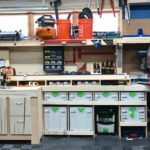 The Systainer drawers are made out of recycled 2x4s that are bradnailed together. Then I threw some thin MDF (was the surface of the old miter saw station) on top and made a faceframe out of leftover poplar plywood. If you pulled the MDF off you’d say “gross!” It ain’t pretty, but it is functional and the mess is covered up. The drawer slides are basic Promark 16″ full sliders rated up to 100lbs. I got them a while ago for a Lego table build I still haven’t started for the kids. And now that our oldest son has grown so tall I’m making that table deeper, and planning to use 22″ sliders. So, I needed to find something for the 16″ ones. Which worked out well because 16″s affords the Festool Systainers enough room to full open at the top. 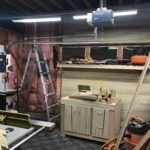 The Bosch sliding miter saw isn’t just amazing it is also fairly good at dust collection when connected to a vacuum. With a simple dust hood you don’t get that small burst of fine dust in your face. Of course, you need to have the vacuum running too! There ain’t no science to to what I did. 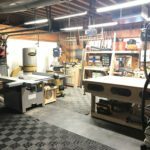 It is just a 39″ tall, 37″ wide, and 11″ plywood deep box that has a 4″ poplar lip trimming around it. Before adding the lip I was getting dust in my face. Just got lucky having the lip that also doubles as a place to store carpenters squares, pencils, an Incra ruler, and a pencil sharpener. There are and were no plans for this build. It was all just measure and go. So, things aren’t perfect. 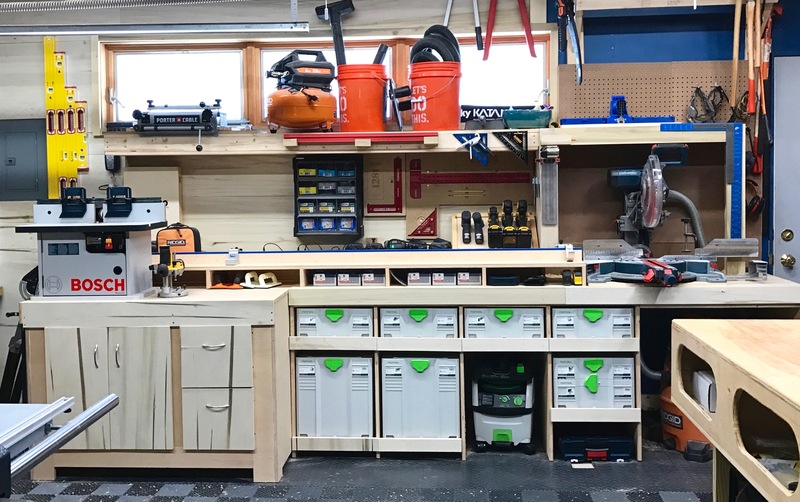 But this is shop furniture. As long as it cuts perfect! 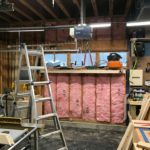 Insulation has already made a big difference this winter!